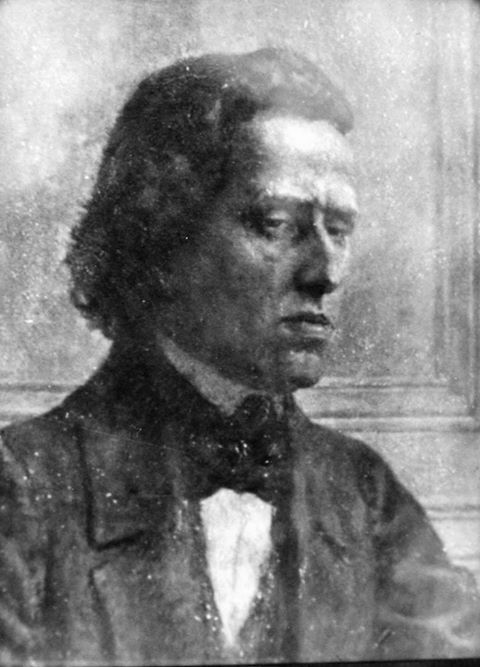 The Institut Polonais in Paris reports that a Swiss enthusiast, Alain Kohler, has come up with a hitherto unknown photograph of Frederic Chopin. The Daguerrotype portrait was taken in or around 1847 in the Paris workshop of Louis-Auguste Bisson. Chopin looks less haggard that usual, and rather annoyed. Dr Kohler was previously responsible for discovering a lost Chopin piano. How extraordinary to see him two years before his death. He also looks more handsome, rugged even, and, though possibly annoyed, less abjectly miserable. Extraordinary finding. Two years before his death. He looks annoyed. Perhaps did not feel well. Congratulations to Alain Koehler for this discovery. I disagree. I can’t imagine trying to create anything as beautiful as the Raindrop Prelude on Majorca if you feel crappy. We’re lucky to have as much as we do. And yet, we know that trip to Mallorca was disastrous in terms of practicalities, wrong season, no transportation, shopping very difficult, and the company being utterly exasperated by it all, especially Chopin who felt bad all the time, according to all reports. Mallorca was not the easy-going tourist destination it is nowadays but a very rural and isolated place, beautiful but rough. Maybe it was a Jewish photographer? Have you problems with your brain? I think that Mr Silverman’s curious comment may allude to the sour grimace that Goebbels pulled when reportedly told that the man photographing him at an event in Germany was Jewish. Before that Goebbels had been all smiles. It does not make Mr Silvermann’s comment less silly. Chopin was aniti-semetic…I see your logic here. We tend to wrongly assume Wagner was alone in this respect. Does anyone else think he looks a little bit like Nicholas Cage? I thought he looked like Bill Clinton in this picture. He does look like someone, I just can’t put my finger on who. No, it’s come to me now. A young James Woods (the American film actor). I’m not sure about its authenticity…. He doesn’t look as fragile as some of the descriptions of him suggest. was in very poor taste. Woke up today and saw this picture. Such amazing news! Seems like 2017 is going to be a good year. If that’s a daguerreotype, it’s either a very strange one, or it’s very deteriorated. Or the published reproduction is “terrible.” As is, it looks more like a drawn portrait than a photographic one. A daguerreotype is generally razor-sharp (unless the subject moves) and this one… Unless, of course, this is a daguerreotype OF a drawn portrait. I think it’s deteriorated. It just doesn’t look like a painting, at all. If he had been sitting for a portrait, no portrait painter would have given him that expression or that angle of the eyes. His eyes are looking askance. Extremely unusual for a painted portrait. I agree that it’s very odd looking. I won’t go so far as to say it’s fake, but the angle is very odd for a photographic portrait from that time, and the lighting does not look like Louis-Auguste Bisson other portrait Chopin. I’m sceptical – this simply does not look quite right (in that it looks a bit too conveniently ‘exactly-what-we-expect/want-him-to-look-like’), and it does not look much like the genuine Daguerreotype of Chopin from 1849. We do not seem to have the actual original Daguerrotype in this ‘discovery’, only this picture of the alleged Daguerrotype. It seems to be based on the pose of the Delacroix 1838 painting, but such a pose is unusual for a Daguerrotype, with its long exposure time, and reliance upon special equipment to constrain the head for a long period. Normaly the photographers tried to feature more of the torso of subjects, not just heads. Here he looks thinner and more haggard than in the authenticated photo of 2 years later. Sceptical flags on alert until more proof, I think. I suspect it’s made using a realistic watercolour painting of Chopin, based upon the death mask, which was then photographed by crude means. Until we learn the provenance of this picture, I remain skeptical. Doesn’t look quite right. We’ve seen other attempted fakes of Chopin before – I recall one claiming to show Chopin on his deathbed. In fact, we are not even sure of the date and photographer of the famous “1849” photo, which is obviously authentic. This new photo decidedly does not have the look of authenticity. We need much more hard information from Mr. Kohler.